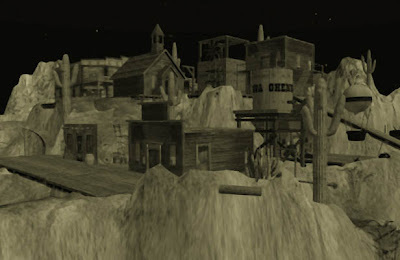 Tombstone is a role-play estate set in the year 1899 that portrays an anachronistic recreation of the late 19th century boomtown atmosphere. Stareyes Galaxy took a coach journey there, to explore the Wild, Wild West of SL. This is her travel report. I set out with the task of reporting to our Readers the true state of the West. In many reports, what I felt a gross exaggeration; the dangers of the frontier are overplayed, and I felt someone needed to set the facts straight. Landing at the welcome center, a greeter is there to welcome the casual visitor and take her through an orientation, upon which she will be able to enter the Tombstone proper. My greeter was an Apache woman, whom, after a first shock, I found very welcoming. I decided to interview as many people as I could, to get a feel of the atmosphere, and how things are run in these parts. First, a rather liberally-dressed young woman, known as Frisco June, led me to Dutch Annie’s, a local establishment for questionable entertainment. She has been in Tombstone for two years. SLE: Is your ... line of work what a lot of women end up with, here in Tombstone? Frisco June: Well no, not many gals like us in town anymore. Maybe 20 or more - but you won’t find any finer entertainers anywhere this side of the Mississippi! SLE: How is your income, as a working girl? Frisco June: the income is good, I make a good living, but I ain’t gonna tell you exactly how much. SLE: Were there many options for employment when you arrived? Frisco June: Oh sure, in this town, ya can be anything ya wanna be! A law enforcer, a doctor, a judge even, with the right schoolin’. SLE: So, even though with choices, you chose this profession? Frisco June: I just love to entertain folks. That’s what I do! What did you think I do? You make it sound like I have a shady job. SLE: Sorry if I worded that improperly. I believe in Women's Rights and suffrage. About Tombstone. What do you like as the best thing here? Frisco June: Never a dull moment, always something happening! And if nothing is happening, well, this place is just full of potential. Well, the town ain’t as quiet as it looks... All kinds of things going on, if ya know where to look. SLE: Are there things you would want to change? SLE: Do you think Tombstone is well-governed? Frisco June: Yes, this town is very well governed, but the most capable and handsome mas... Mayor Adrian is ... well, kind of a personal hero to me. He just has his hand in everything, and always able to help folks... and just such a charmer! SLE: How about the regular folks here? Good folks, or bad apples? Frisco June: Oh, we got all kinds here. Good honest God-fearing folks, and the odd outlaw and rogue. SLE: Yes, the outlaws. I was concerned, getting off the coach, about the reputation of the town, for outlaws. Frisco June: Oh, nothing to worry about, the law has them under control! SLE: I am glad to hear that! Frisco June said about Dutch Annie’s that it is the hub of the social life in tombstone, always full of delightful banter, part of which I was able to enjoy in her delightful company. Out of character, she told me of her journey to the actual Tombstone in Arizona, and how, after spending a considerable amount of her SL time in Tombstone, she felt there as if she were coming home. The stories of the “Doves” of Dutch Annie’s came to life for her. Later, I visited Boot Hill Cemetery with Frisco June, and hearing her talk about the legends of the heroes of Old West and those passed away in SL buried there brought tears to my eyes. I found the location of Tombstone Epitaph, the local paper right on Allen Street, kitty corner from Dutch Annie’s. Jenna Odisark is the Editor. SLE: Miss Odisark, as the Editor of the Epitaph, you must get the stories right from the horse's mouth. What is it like to be the news distributor of Tombstone? Jenna Odisark: It’s been very interesting, getting to experience so many different aspects of what goes on here. I mean, the normal activity of the town, the special events, but also with the kids and the Natives. SLE: How long have you been Editor? Jenna Odisark: I've been a reporter here for nearly three years... this coming issue is only my third as editor. SLE: What is different from the other papers, editing Epitaph? Jenna Odisark: Since Tombstone is so much larger, and has so many more aspects to it than most other places... that is the biggest difference for me - trying to keep up with all of it. For example: in this issue we had a balloon festival, elections for a mayor in a town nearby called Black Diamond, court report of trials, and a live music fest - just to name some of the highlights, and that doesn't include regular features or columns. SLE: Do people volunteer the news, or do you have to go after it? Jenna Odisark: Both actually. There are several who send in ideas and such, and then sometimes I hear of something and have to go research or try to get interviews. I arranged a few interviews at the Epitaph office, with gracious allowance from Miss Odisark. The first one I interviewed was Neasa Quandry, a new traveler in Tombstone. SLE: How long have you been here in Tombstone? Neasa Quandry: Almost 2 swhole weeks now. SLE: How do you like it so far? Neasa Quandry: I really do love it here. So much to see, and the people are so very nice and helpful too! SLE: There are many kinds of folks here. With whom do you identify yourself best? Neasa Quandry: Oh dear me. I really don't know. SLE: Where do you come from actually? Neasa Quandry: I am from Atlanta, Georgia. We moved to Augusta soon after the war. SLE: And, thence to the West? Neasa Quandry: Oh yes, I had to venture out. I had heard of all the opportunities out here. I traveled with a companion, a girl. But, she stayed in Dallas. SLE: Of course, a young woman like you would like to have "prospects". Do you see such here? Neasa Quandry: I have seen some nice 'prospects' yes. SLE: Ahem. Have you been accosted inappropriately? SLE: How about the womenfolk here. Have you found them welcoming? Neasa Quandry: Oh yes, very much so. I have made a new friend, and she has offered to help as much as she can. Stareyes Galaxy: How about the element of danger on the streets. How do you embrace it? Neasa Quandry: I have heard much about it, but I haven't felt fear of any sort. It seems that as long as I stay within the town limits, I should be fine. SLE: What are you most looking forward to here in Tombstone? Neasa Quandry: A new way of life. And, with that a new life. SLE: How do you like the atmosphere? Neasa Quandry: I do like it. There are many things to do and of course, I love to shop. Neasa told me the roleplaying is a bit more difficult than what she anticipated. She appreciates the loving detail put in the anachronistic recreation of Tombstone. She manages a garden center elsewhere in SL, but looks forward to opening a small shop in Tombstone as well. The next person to enter the office for an interview was Lot Balbozar, of whom I had heard of as one of the town notables. He operates the Crystal Saloon in town. SLE: Have you ever been interviewed before? Lot Balbozar: Only by a judge, a sheriff and US Marshal ma’am, but I lied to ‘em all. SLE: Well. I want you to be truthful. The folks back East have such wild misconceptions, spread by the sensation press. The Enquirer is as respectable as The Epitaph, portraying a balanced view. How long have you been in Tombstone? Lot Balbozar: Five years ma’am. SLE: There are all kinds of folks in Tombstone. Who visits Crystal Saloon? Lot Balbozar: Most any folks, drifters, some vagrants, just the regular types. SLE: Many people in the East seek fortune emigrating to the Territories. Reports of the violence and other hazards however prohibit many leaving the East. What is your attitude to the frontier and what advice would you give to prospective travelers of Tombstone? I chanced on two young characters on the street. The first one, Hannah, is an orphan, living by her street smarts. 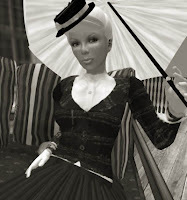 SLE: It looks like you have a varied experience in SL without a home. Is this an extension of that lifestyle to you, here in Tombstone? Hannah: Yes it is. Personally I look for the reactions of others to seeing a dirty black child hovering around. In tombstone I get to do it without adverse comments. Some are kind others are sexual but then some disgusted, outside Tombstone that is. It fitted in perfectly for me... The runaway fighting for survival, living from hand to fist. SLE: Are there many orphans here? Hannah: There are quite a few pics on display at the orphanage, so I'd guess so. I haven't met anyone else yet though. Hannah went out to lead me to the orphanage, which is a huge house, comfortable-looking but haunting at the same time. “As far as 'orphan' goes, I'm more of a self-imposed orphan.” She described herself as a runaway from an abusing son of a kindly master, leaving home when her mother got one too many children to support. Finally, Talula Shippe, a girl of seventeen, took me around the sims on horseback. I had trouble getting on the horse, side saddle behind her, but she proved an expert horse rider and guide. 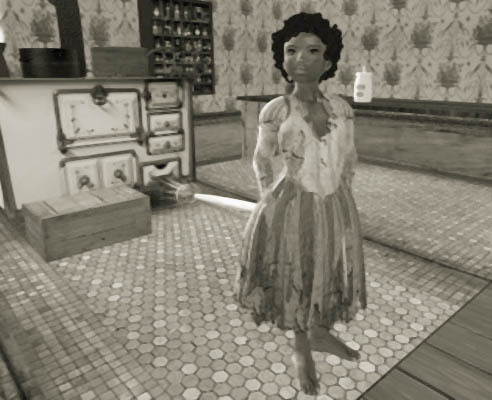 She described her position as an adolescent as having to tend to duties at the orphanage, going to school and so on, and with the orphanage matron “gone missin’” there is a lot to do. SLE: So you tend to yourselves? Talula Shippe: Fer now, yeah. I moved back in when no word came fer a week. Since I'm seventeen an’ they needed a cook. We rode over to the East, to the border of the rogue town Ghenna, then across to an Apache village, and around more hospitable areas near Tombstone proper. Talula Shippe: Well... That depends on when ya start countin an if ya ever stop. I came here when I were eight. Problems on the rail. My mama died. So I stayed here. But I left again when my Aunt Polly found me. And Aunt Polly died and I left Frisco an came back here bout ...four months ago now? I were gone three years. SLE: Interesting. But you came back. Talula Shippe: Yessum... Don't got a family. They all die. These people ‘bout as close as they come. SLE: How do people treat you here? Talula Shippe: Well... purtee good, I reckon. I got hit by a woman an’ my bruise done faded sometime last night but That were a rare occurrence. Most people are real kindly. SLE: As a young girl, on the street, do you have any means of self-defense? Talula laughs nervously, rubbing her neck. "Well I'm not really on the street much.. used ta be I carried my slingshot around, an lots of the youngers still do that. But I guess my biggest weapon's my adult friends. So many got a gun on their belt, so it's kinda mine by default." SLE: Do you get any... improper advances, from the less-upright male population? Talula Shippe: Not iffin’ they don't want a box on the ears from the Mayor --dangit, them double negatives!-- cause that Mayor's a real hum... Senor Tight Breeches. He dictates that the youngers can't really do much in the way of courtin’. So I don't know the law books TOO well but I reckon there's a fine an maybe jail time fer askin me out to the bowlin’ alley! Regrettably I had to leave Tombstone for the next few weeks, after only a few days of visiting. I saw quite a lot and felt that much more was still left for me to explore. The simple and welcoming folks in Tombstone did not seem at all averse to strangers, and I anticipate my return from my holidays with hopes of making more friends in Tombstone. 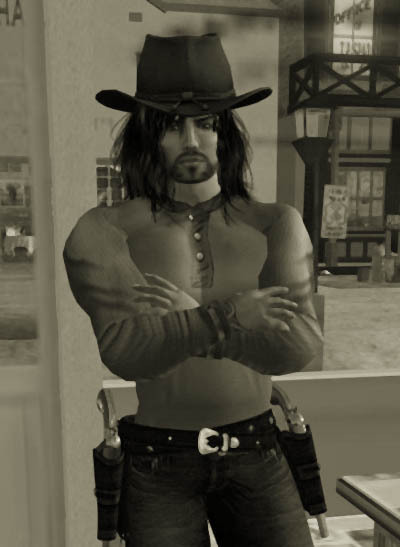 I wish to thank Yoki Kanya, Shaya Inglewood, and Jill Kasei who first introduced me to Western roleplay. 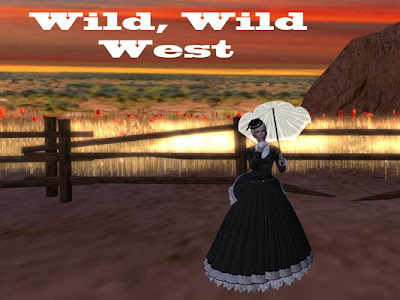 They are best found at the German Arizona sims, another 12-sim Wild West RP environment, more modeled to the fabled West of old. I wish all avatars an enjoyable experience, should you venture out West! The other guy is right, the role play amounts to a lot of AVs standing around chatting, and most action is carried out with weak storytelling. Tombstone admin (most of which don't even RP on the sim) have a long reputation of abusing their abilities and being unchecked in their behavior towards players. Weapons are overpriced and little to no support or info on them is offered. I wish it didn't have to be that way, but this is why rival Western sims have repeatedly sprung up to give players an better experience at Western RP.